Do you remember your first lemonade stand? The formula may be simple, but this time-tested neighborhood enterprise has all of the elements of a startup business in miniature. Take look and consider how these principles might apply to your own fledgling business. When calculating startup costs, it's essential to consider both the market and the product you want to produce. 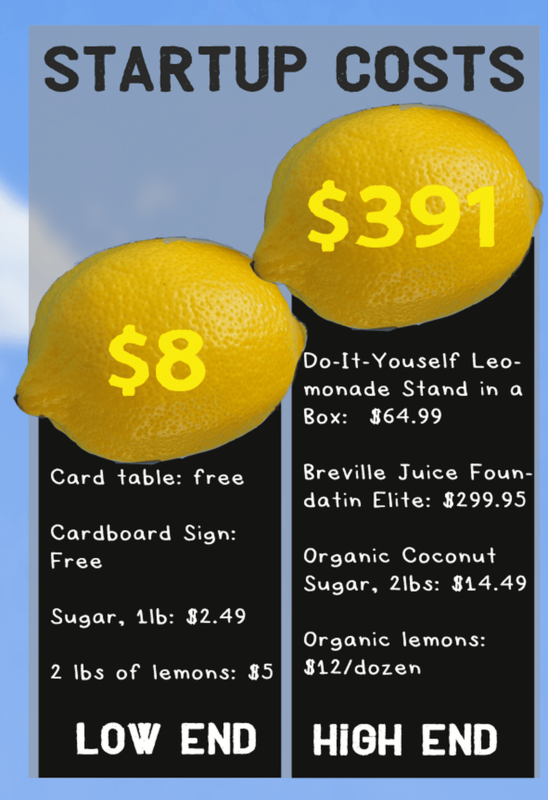 In our infographic analysis, the startup cost of a lemonade stand in today's world would range from under $10 to almost $400 for a pre-fab stand ordered from the internet and a fancy Breville juice extractor. Temperature: in the lemonade game, a hot day can make all the difference in your customer's desire to pay a premium for your product. Interestingly enough, some canny lemonade entrepreneurs are experimenting with "free" as a business model. We all want to make more money in our businesses. To do that, you need to look at the most common ways of increasing profits: increasing the amount you sell, raising prices, or cutting expenses. As mentioned above, startup costs for lemonade stands can balloon if you are after an artisanal product. Likewise, production costs must be carefully factored into the enterprise. Sibling labor in squeezing lemons (usually free) can be a good way of getting the business off the ground. A family business is common -- but fraught with peril. How do you encourage your kids to go into business without being oppressive? How do you fairly divide up labor between relatives who may have differing skillsets? And what kinds of sacrifices are unique among family businesses? The lemonade stand is your classic grass-roots enterprise, and as such it relies entirely on marketing's holy grail, that is to say, "word of mouth." So good lemonade entrepreneurs must become masters of creating an experience that separates them from the competition through their offering, perhaps through an enhanced customer experience or even a cute puppy spokes-animal. So-called "growth hackers" look for "spreadable" or social experience when they are looking for a hook to grow a business. For example, the car service Uber quickly gained traction in its major markets because it was a much easier way to get around than hailing or even calling a taxi. And because the experience of taking an Uber to a party or a club is so social, it became a "spreadable experience." Kids as young as six can make great entrepreneurs -- and according to Kidpreneurs co-author Adam Toren, they actually have unique skills such as curiosity and risk-taking that can put them at an advantage in business. Read on to find out how you can encourage entrepreneurial skills in your youngster -- and even a thing or two more adult entrepreneurs can learn from the "kidpreneur" generation!